(SPOILERS) Pure cinema. There are plenty of directors who engage in superficial flash and fizz (Danny Boyle or JJ Abrams, for example) but relatively few who actually come to the medium from a root, core level, visually. I’m slightly loathe to compare Edgar Wright with the illustrious likes of Sergio Leone and Brian De Palma, partly because they’re playing in largely different genre sandpits, partly because I don’t think Wright has yet made something that compares to their best work, but he operates from a similar sensibility: fashioning a movie foremost through image, supported by the soundtrack, and then, trailing a distant third, comes dialogue. Baby Driver is his most complete approximation of that impulse to date. 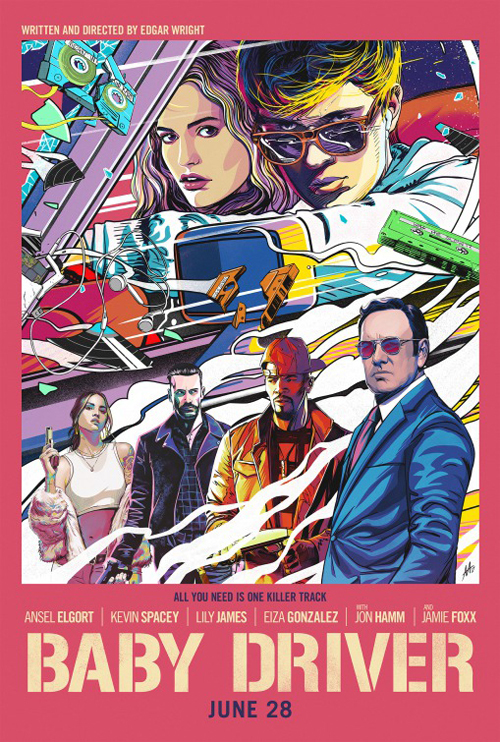 Wright is very much a pop culture magpie, occupying a distinctive space to the more operatic posturing of the aforementioned Leone or De Palma, but the way in which Baby Driver utilises score to inform the scene or sequence, and the grander palette of the movie itself, corresponds entirely to Leone’s marriage to Ennio Morricone, or De Palma’s to Pino Donaggio (and later Morricone). And it’s a different thing to Tarantino, who has become increasingly adept cinematically over the years; for him, the word is at least as important as the image (notably, when he exchanged vows with Morricone, it was 50-50 through appropriating existing tracks). Baby Driver puts in perspective the problems with The World’s End, a resounding disappointment after Wright’s first two comedy (horror and action genre respectively) spins with Simon Pegg; it represented a retreat, to safer, familiar ground, and the spark that fuelled their previous collaborations had fizzled. I wasn’t overly impressed by Scott Pilgrim vs The World at first sight, but it has grown on me since, and Baby Driver, which Wright has had in his head for two decades, and which can be seen in embryo form in the Mint Royale Blue Song video that shows up briefly in the movie, represents the next step on from this, distilling a movie to its motive essence while forsaking theatrical devices as much as possible. 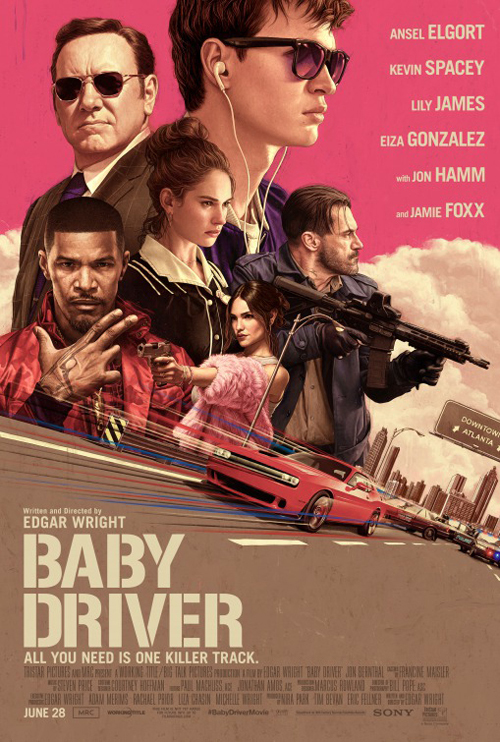 It will be interesting to see if Wright subsequently retreats into something less distinctive, but the confident manner in which he has designed and written Baby Driver suggests otherwise. Sure, one might choose to reduce the movie in summary to an extended pop video, but that would be to underestimate how well it also works as a character drama (which it is, in a heightened way, for all that it is frequently very funny, or elicits laughs for its sheer audacity), and how Wright’s choices on the soundtrack fuse with the material in a diegetic manner not even seen with Tarantino (the most obvious comparison in terms of a tendency to litter a picture with eclectic favourites from one’s personal music library). Wright’s best foot forward in this regard is treating “young Mozart in a go-cart” Baby as all-but a silent movie character, so placing a distinctive onus on how the picture is staged and viewed, and how its characters interact with the lead. Baby appears passive or distracted by his own interior world, yet he’s gifted multitasker, possessed of sufficiently extraordinary “super” skills (his weakness also fuels his greatest strength, like Daredevil but on the other side of the law). He’s simultaneously supremely nerdy (OCD obsessiveness with regard to recording music) and unflappably cool (as an unassuming presence in a criminal milieu). Ansel Elgort is possibly not destined to be nearly as singular in other material (I’ve also seen him in the Insurgents and The Fault in Our Stars where he’s fine, I guess), but he’s perfectly chosen here, non-descript enough to be a blank canvas for his director, allowing his fellow performers to hog the camera and steal the best lines, but with sufficient presence to make you care and become invested when it counts. I had a nag of concern during the first scene, where he begins acting out a similar accompaniment to the chosen tune (Bellbottoms by Jon Spencer Blues Explosion) to Noel Fielding in the Mint Royale video but without the concordant flourish of a natural comedian, worried as I was that this would grow annoying very quickly if it was going to be par for the course. Instead, it really merely sets up his goofiness. Just as, conversely, if someone with definably comic chops had been handed the main role, it would likely have detracted from the heart of the piece. That said, there are a few areas where Wright doesn’t wholly deliver. Most notably, the backstory concerning Baby’s mother (Sky Ferreira) and the tragedy that scars him. I can’t help feel the explanation for his tinnitus and permanently attached earphones would have been better covered by a simple soundbite, rather than the cloying, mawkish flashbacks Wright returns to as if he has been consuming a copy of Studio Screenwriting 101. You might argue these insights are needed to explain for his endearingly buoyant relationship with his deaf foster father (CJ Jones), but since you don’t really get a joined up one for it anyway, the movie could have done with leaving the substance of his mommy obsession to our imaginations. Initially, I was a little surprised by the choice of ending, since Wright seemed to be heading for a clean get away, and more still because the actually execution is a little perfunctory, almost as if he had to be persuaded to go that way and his heart wasn’t really in it. Part of that may be the rest of the picture failing to leave one feeling it is instilling a moral, despite heavy foreshadowing like “One of these days, Baby, you’re gonna get blood on your hands”, so falling back an old Hollywood, “crime doesn’t pay” coda. But Wright has actually instituted a very measured progression to the picture, that one may or may not see as a commentary on the deleterious effects of detachment from reality, be it through computer games, movies, TV, music or any heightened, escapist state; the problem is that he sort of screws the pooch in the pay off. It’s a bit of a shrug, rather than a celebration. In the first heist, Baby is in his element: everything runs perfectly, and he is safe in his own bubble of music. There are no consequences; it’s the ideal bloodless movie robbery. In the second, however, his equilibrium is upset as ugly reality intrudes. The sight of the corpse of a security guard throws his timing off, following which the escape becomes all about skin-of-the-teeth escalation, with Baby’s nose is rubbed in the brutal truth that others don’t share his values. And so the third, in which Baby is no longer supported by the “honourable” crutch for his misdeeds (his debt is paid off, albeit he is still under threat from Doc), where everything going wrong as he finds himself unable to countenance the gulf between moralities; he tips off the post office cashier, which leads to his decision to make an outright stand against his accomplices. This final sequence is particular illustrative of how coherently Wright has designed the picture; Baby loses his comfort blanket, his iPod, and is left fleeing the fuzz through the streets to the soundtrack of the ringing in his ears. It occurred to me that the ending, with the released Baby reuniting with Debora (Lily James), is Wright riffing on Wild at Heart, although that picture’s depiction of justice was entirely oddball. This would dovetail with the undoubted influence of True Romance (in which the heroes do escape, only mostly unscathed). There’s very much a wish fulfilment fantasy going on in both Wright’s and Tarantino’s movies, in which a young geek type/director stand-in holds his own against the criminal underworld with the aid of his plucky fantasy girlfriend. Although, it has to be said, unlike Patricia Arquette in True Romance, Collins’ part amounts to little more than a cypher. And also, the fresh-facedness of Wright’s leads invokes a John Hughes movie – appropriate, given the title, which is more digestible the more you contextualise it, but still feels like a mistake that ran the danger of misleading undiscerning potential audiences as to the content of a picture that needed all the goodwill it could get to make an impact on the summer scene – rather than Tarantino (or Tony Scott). Nevertheless, if Debora has little more than an object-of-attention role to play, Wright succeeds in investing us in the stakes of these two getting away. He fills out the rest of the cast out with vibrantly colourful characterisations, caricatures even, and lets dependable actors breathe life into them. Often, they are very funny – I’m torn as to whether I’d have liked to see more of Jon Bernthal’s Griff (“If you don’t see me again, it’s because I’m dead”) at the expense of Jamie Foxx’s Bats (I was half expecting the former to be brought back, so bringing bad luck on Doc’s rule never to work with exactly the same crew twice), although both fulfil virtually the same function. Only, Bats is more bats (“I’m the one with the mental problems in the crew. Position taken”). And dislikeable, such that the point where the worm turns, and Baby gets his hands dirty, is the picture’s most cathartic moment (it’s also Wright learning from his De Palmas, or Hitchcocks, if you will, establishing the poles sticking out of the back of the truck a good five minutes before they’re called upon, to probing effect). I wasn’t too sure about Bats’ ability to divine chapter and verse on someone’s life story, however, since it seemed like a slightly clunky means of serving backstory. Jon Hamm finally gets a movie role worth his salt in Buddy, with Wright utilising his alpha male credentials to shrewd effect, first putting him on Baby’s side, bonding with the babe over music choices and defending him against the less tolerant members of the crew(s), and then having him go ape when Baby torpedoes the robbery and Darling (Eliza González) gets killed. Again, Darling is less defined than her other half, although González still makes the part memorable. Her exit is maybe a little too ‘80s homage (a hail of squibs while firing two automatic weapons simultaneously), though. As is Kevin Spacey’s, who does this kind of part in his sleep, only usually with a better wigmaker. He’s currently in danger of becoming little more than an Anthony Hopkins walk-on presence in pictures, reliable for showing up and providing some instant polish, but overfamiliar for doing exactly that kind of thing. I didn’t completely buy Doc’s change of heart at the end (“I was in love once too, you know”), or the decision to send him out in a blaze of gung ho bullets; it plays as if Wright reached the point of needing to close off loose ends and took the easiest option. That said, Doc’s interaction with his nephew (Brogan Hall), capable of casing a joint in the blink of an eye, is very funny. Wright has professed to using Water Hill’s The Driver as reference material for shooting the chases in Baby Driver, and they’re flawlessly executed. Elsewhere, he’s clearly invoking Michael Mann’s Heat with the heavy firepower unleashed on urban streets. Perhaps the only action that feels a little standard-issue is the carpark garage finale with berserker Buddy. Not that it isn’t effective, but it doesn’t feel as if its doing anything sufficiently different to any other given action movie. Elsewhere, the director flashes on more recognisable comic devices (the wrong Michael Myers masks) and references his love of The Phantom of the Paradise (Paul Williams as an arms dealer). He’s also adept scenes absent a supporting soundtrack; Baby’s attempt to take off on the night before the heist and the subsequent diner scene find Wright ratcheting up the tension to masterful effect. As for the soundtrack itself? It’s definitely one to be taken in context, where the positioning of the tunes, rather than necessarily the tunes themselves, are the key. And yes, eclectic is definitely the word. Baby Driver might be the movie of the year to date, and it might well remain that way. It’s a definite sign that Edgar Wright is right to leave Cornetto trilogies behind him and explore his own thing solo. And, after the expensive flop of Scott Pilgrim, the playing to a familiar beat with The World’s End, and the disappointment of “creative differences” (Marvel being wankers) leading to his exiting Ant-Man, this came in on a budget-friendly scale (it looks far more expensive than it was) and should surely have studios knocking down his door for whatever he does next. If he keeps things inimitable, he shouldn’t put a foot wrong.